Potentially my most despicable recipe yet. When I created Slutty Brownies all those years ago, I could never have dreamed of the monster they would become. 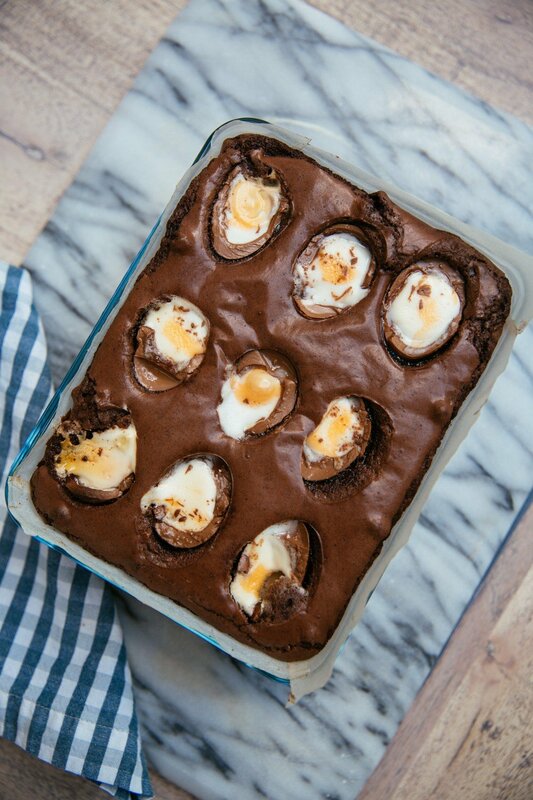 A layer of soft cookie dough, topped with Oreos, topped with brownies, and now… topped with gooey Creme Eggs. Because they’re oh so easy and completely and utterly filthy. Eat them warm, when they’re still gooey. Prepare yourself for utter bliss. Pre-heat your oven to 350F, 180C. Mix up your cookie dough, following box instructions + extra tbsp of water. Line your baking tray with paper, smooth dough across bottom. Eat any that are left over. Mix up your brownie batter (according to box) then pour over top. Halve your creme eggs, length ways with a sharp knife. Don’t worry about them being perfect. Perfection is for people with no imagination. Place into the middle of your oven and bake for 45mins (for gooey) or 1hr (for set brownies). When they’re done, place on side to cool. After 10mins or so, carefully lift the whole thing out, using the paper. Slice into squares and serve with hot tea or cold milk. Use a fork to mine your way through those incredible layers of unadulterated pleasure. Happy Easter and here’s to a very Slutty weekend!